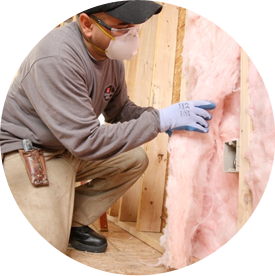 Prime Energy is our go to consultant when it comes to insulation and modeling home efficiency. They have been indispensable during planning and bidding phases of the construction process. Once the project has begun, we can count on Prime Energy to be timely and cost effective. From sound bat to complex spray foam insulation, Prime Energy has been an integral team member for our construction projects. Both my wife and I thank you and your company for the outstanding workmanship exhibited by the entire team from the PRIME ENERGY GROUP. I had gotten three bids on having our den entirely foamed after it had to be completely gutted down to the studs because of wind blown rain from last April’s tornado. It took us several months after the tornado to determine that we had a serious mold problem. We knew that we wanted to use foam instead of the conventional fiberglass insulation that we had previously. We then proceeded to get three bids on having the insulating work done. Your company was just slightly higher priced than the other two bids. We made our decision based on your presentation and the fact that you were so much more knowledgeable than the other reps. that came out. That added to the fact that you also were personally certified in energy conservation. Everything I knew about the benefits of foam over conventional insulation I had learned either from the Internet or having watched a lot of home remodeling shows on TV. The other main decision maker was the fact that you personally assured us that you would be on site to get the crew started and would then return prior to them finishing to make sure it was up to your standards, made us more confident that we would get the workmanship that we were paying for. Needless to say, we highly recommend your company to anyone who is even considering using foam insulation. 17 months ago Jay and crew insulated our attic and crawl space. Not only were they extremely neat, clean, and professional but we have been saving an average of at least $50 a month. So far that amounts to a total of $850 savings! And as an added bonus we no longer have mice, pests or even the occasional snake in the house…a huge plus since we live in the country. We are building the first Habitat home in 4 years and wanted to make this one as energy efficient as possible. Prime Energy Group has gone above & beyond other companies by thoroughly explaining the whole process of using spray foam insulation. Their knowledge & dedication to doing the job right is incomparable. Josh Collins has quickly responded to all of our questions & requests, with patience, and the installers did a wonderful job. They were professional, on time, courteous, and completely cleaned up afterward. We are already planning our next build and intend to use Prime Energy Group again. I highly recommend Prime Energy Group. Jay and Dave are very knowledgeable and conscientious about the product and services that they offer. Their team has been an excellent resource for us in planning our projects to maximize our energy efficiency and make smart choices during the building process. They have completed their work on time and the workmanship has been excellent. We are glad to have them as a part of our building team. My company’s experience with Prime Energy Group has been a very positive one. Their product presentation was clear and thorough. Their product installation was completed in a professional manner. I will continue to use Prime Energy Group in future projects. Prime Energy Group helped make a recent modernist design of ours possible. With their help, we were able to educate and encourage a client to consider long-term operating costs, rather than exclusively initial construction costs, in the bidding process for their project which resulted in a better product for the customer and a lower environmental impact in the long run. The team went out of their way, producing extensive additional documentation on the house and building system, for both the client and the building official, well above and beyond the call of duty for the sake of a successful project. We hope to use them again in the very near future. During the past two years we have counted on Prime Energy Group to apply spray foam insulation for our homes. Their installation methods allow for consistent applications and have always left my job sites clean and ready for sheetrock. I especially appreciate their care to avoid future problems with our plumbing and electrical rough-ins. 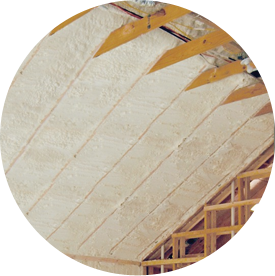 They provide timely service and a sound technical background that compliments the building science and advances associated with the spray foam insulation industry. We would like to thank Rich and the whole Prime Energy Group Team for the outstanding job on our home’s exterior wall insulation project. This project was different from most where we were having our insulation replaced from the outside. Rich worked very closely with Triangle Home Exteriors Inc to coordinate when our home’s siding and fiberglass insulation would be removed so his team could quickly come in and spray the foam insulation. As with most large renovation projects, there was a snag when we found some weather damage to the structure, preventing the insulation from being completed in 1 day. Rich stayed in contact with Triangle Home Exteriors Inc and was able quickly get his team back to complete the insulation project once the damage was repaired. Our neighbors have dogs and we were concerned with the wind blowing the trimmed foam into their yard. Rich’s team was very professional and keep everything neatly contained in the area they were working. Everything was quickly picked up and disposed of and our neighbor didn’t even know they were there. In the 1st week of the completed project, we have already noticed that our home is much quieter and more comfortable. The outside temperature has been in the low 90’s but our AC does not seem to be running as often. We will be sure to give Prime Energy Group a call when we are ready to have our crawlspace insulated to complete our home’s insulation replacement project.